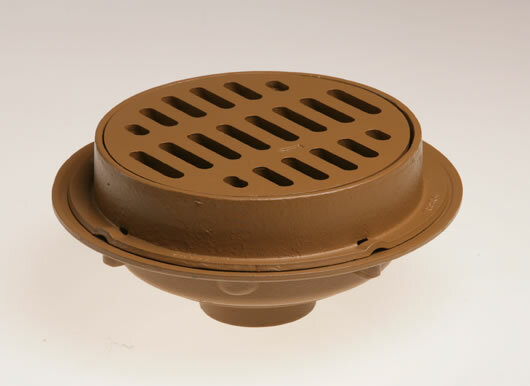 2142 Heavy Duty Floor Drains with 12" Top Solid Free Bucket - Jay R. Smith MFG Co.
Used in heavy trucking or traffic areas where waste water contains sand, sediment and other debris. Drain has solid free standing bucket to intercept this type of debris. Duco Cast Iron Body and Flashing Collar with Cast Iron Tractor Grate and Solid Free Standing Sediment Bucket. Smith No. 2142 cast iron drain with flashing collar and solid free standing sediment bucket with tractor grate. Smith No. 2147 for side outlet.